OUR STRONGEST COMPLEX FOR MAXIMUM HEALTH BENEFITS. All natural Mushroom Complex 4 dual-extracted, high potency, complete mushroom formula. 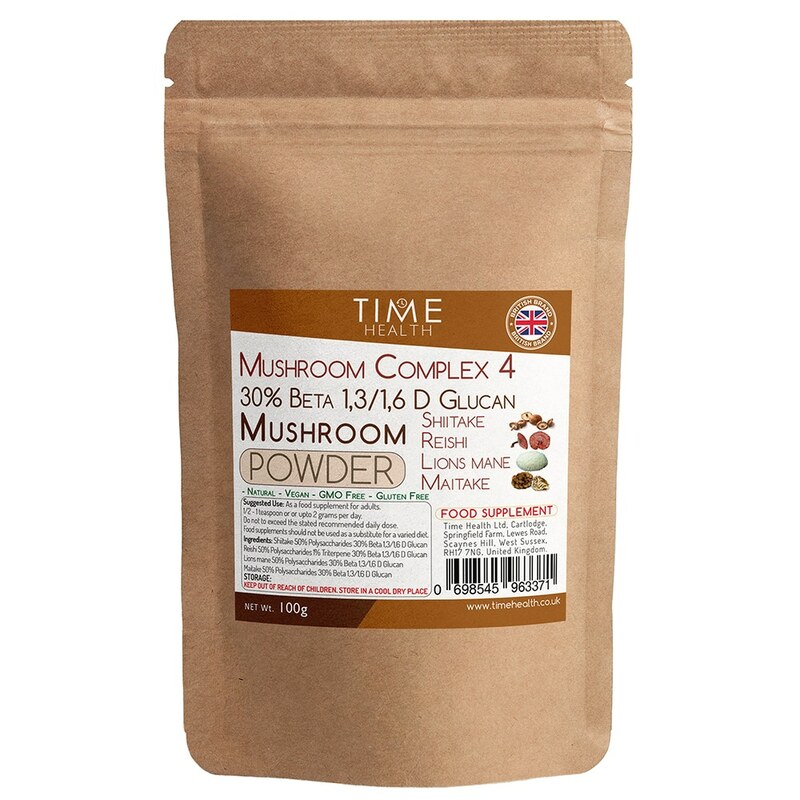 Contains an equal mix of four different mushrooms, Shiitake, Reishi, Lions mane and Maitake. Only the most complex part of the mushroom is used – the fruit body – for maximum benefits. DUAL EXTRACTED, 3RD PARTY TESTED. Alcohol and hot water extraction used to draw out water-soluble and the non-water-soluble bio actives. Beta glucan content is 30%, 3rd party tested in the UK and Ireland. HEALTH BENEFITS. Our mushroom complex 4 contains carefully selected, powerful medicine mushrooms with benefits including immune, gut and cognitive support. NATURAL. Our mushroom are grown without chemicals or pesticides on the following Lion’s mane = Hardwood sticks, Maitake = Hardwood sticks, Reshi = Duanwood logs, Shiitake = Hardwood sticks. I enjoyed this product. It is a little hard to tell which mushroom is effective when you mix like this however. I will purchase the extracts separately in the future and I have a weak spot for lions mane so I will probably go for that first! I bought this item to help with a mouth infection which had recurred after an operation 2 years ago on an infected root canal. My mouth had started to feel uncomfortable, tight and hot. As soon as I started to take the mushroom complex all these symptoms disappeared. I bought the powder, as I'm not keen on tablets, and am taking 1/2 teaspoon twice a day.I had been trying some health supplements that I had taken previously plus cucumin but it was the mushroom complex that really made the difference. I'm so grateful that I found it. Time Health also gave me wonderful help in choosing the right complex for my needs. Thank you.